It's outdoor olympics day at school when the Prince of Pride arrives with a new trophy for the Greatest of All Time! Mason wants to win the prize so badly that he forgets to pick his best friend Sophia for the team baton race. Will Mason's desire to win keep him from helping his best friend? 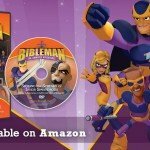 Join Bibleman and his team as they help the kids overcome a bout with the Prince of Pride and learn how God values friendship instead.